Massive ‘Yellow Vest’ protests over fuel price hikes, which have swarmed the streets of French cities for almost two weeks, have the support of about two thirds of the French, a new poll shows. Protests turned violent with rioters setting barricades ablaze and police unleashing tear gas and water cannon at the demonstrators. Some scenes, especially in the heart of Paris, looked like a warzone. 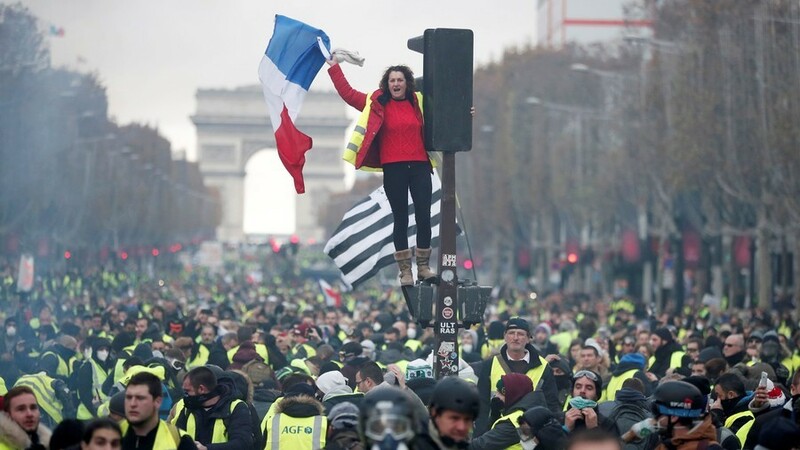 The rallies were triggered not only by rising fuel prices, but also President Emmanuel Macron and his unpopular efforts to overhaul France. It turns out that people across France strongly support the upheaval, a new OpinionWay poll showed. The survey asked over 1000 people and 66 percent answered that they stand for the protesters. The poll was conducted on Tuesday when Macron addressed the demonstrators, offering them minor concessions. They included a three-month consultation with associations that lead the protests and a proposal of a mechanism to adjust tax hikes. He, however, refused to scrap the rise in fuel taxes on diesel and petrol which are due to come into force in January 2019. The speech angered at least 76 percent of the respondents who called his measures “wholly” or “mostly insufficient,” the survey showed. Nearly 80 percent still oppose the planned fuel tax hike. The government claims the rise of fuel taxes is aimed at promoting environmentally-friendly policies, but the proposal has been met with a fierce response from the public. National Rally (formerly Front National) leader Marine Le Pen said Macron’s government has “a total lack of empathy” for the protesters. Macron’s policies, particularly his handling of the economic situation, have already triggered multiple protests throughout the country. The French leader faces plummeting approval ratings amid social discontent with his reforms, such as tax relief for businesses coupled with cuts to pensioners’ benefits.